We are bbbbaaaaacccckkkk!!! Now it’s time to climb back in the saddle and get after things again. Before we get into news and polls, I just want to comment on what a wonderful summer trip we experienced. 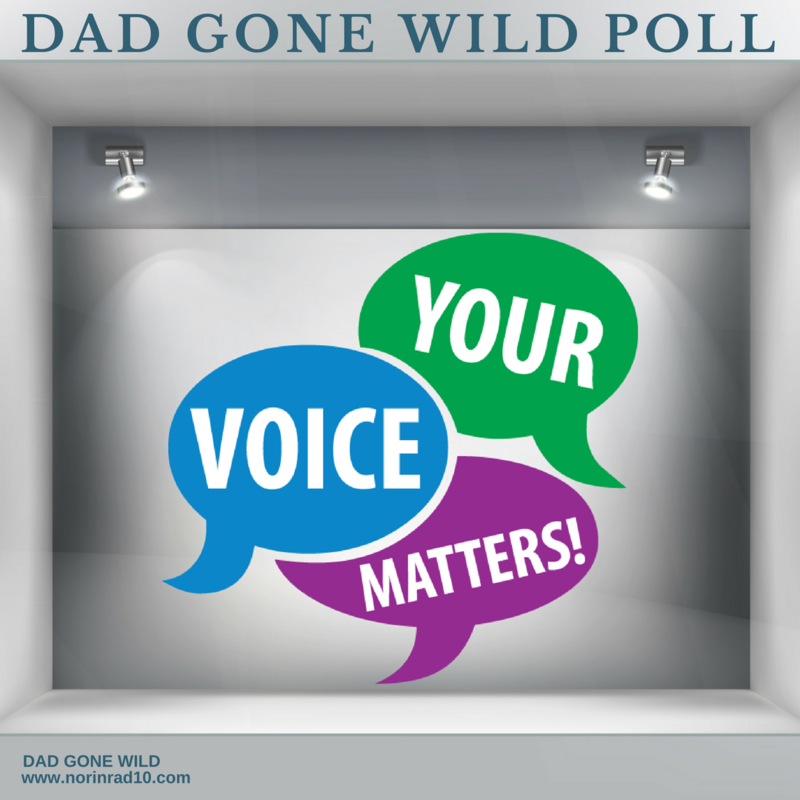 DGW and family went from the wilds of the Pocono’s to the wilds of NYC. We camped outside Blacksburg, Virginia in a idyllic campground that unfortunately had a train track running down the middle. A fact we were made aware of at 2AM when we felt like we were sleeping on the tracks with an oncoming train bearing down. While home I learned more of my families history. I always knew that my mother was a refugee from Russia who’s family fled to Germany during WWII. What I didn’t know was that my grand mother’s family were Mennonites, who were caught between Russia and Germany during World War II and forced to flee or be killed. They were peaceful people who had worked hard to build new lives after emigrating from central Europe only to be persecuted when Lennon rose to power. I need to research more but it certainly makes our current situation resonate even more with me. 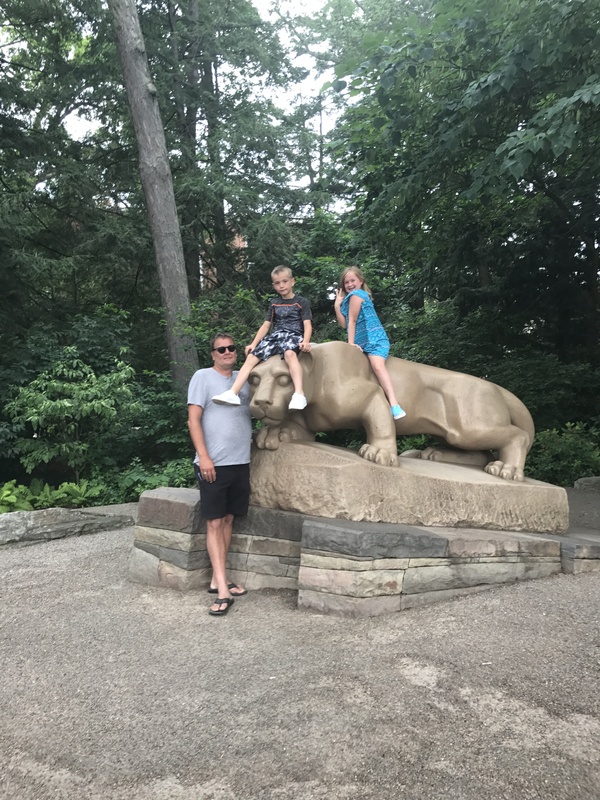 On the way back from the Pocono’s to Nashville I was able to visit State College for the first time in 25 years. Walking those streets again opened a vault of old memories. God, I love State College. We stayed over night in Morgantown, West Virginia and enjoyed another fine American college town. I really couldn’t have asked for a better trip and am grateful for the opportunities and reflections it provided. My family also make excellent traveling companions. Do you remember how last week I was talking about how Tennessee’s ESSA report was receiving rave reviews despite having some obvious holes? Well as always there is more to the story. It seems that Louisiana’s Education Plan was getting the same rave reviews despite having the same holes. This raised a flag for the writer of the blog Educate Louisiana. They did a little digging and found “the praise given by the various education reform groups has little to do with the plan’s actual adherence to the ESSA law and its ability advance our state in the quest to climb in educational rankings. Put simply, they praise the plan because of its strong resemblance to the previous waiver acquired under the No Child Left Behind law. The same plan that after a decade (the last five under Supt. White’s waiver plan) still leaves Louisiana’s educational ranking at the bottom.” I encourage you to click the link and read the whole piece. Betsy DeVos continues her quest to be the most unpopular US Secretary of Education ever. This week two lawsuits were filed against the Department of Education and DeVos in regards to the Borrower Defense Rule aimed at protecting post-secondary students from abuses of deceptive, predatory post-secondary institutions. One of the lawsuits were filed by two individuals, the other by 18 state attorney generals. Wonder if DeVos’s actions had anything to do with her bosses experiences with the Borrower Defense Rule? In the ever expanding language manipulation category I’ve got a new one to add to your lexicon, personalized learning. Per usual, it doesn’t mean what you think it does and also per usual, Jennifer Berkshire and Peter Greene are on top of it. I’d recommend you listen/read what they have to say because I predict you’ll be hearing the term a lot this year. MNPS recently released it’s strategic framework. Not to be confused with the strategic plan, which comes later. Music educator Walter Bitner takes a deep dive into and finds it lacking. I can’t say I disagree with his observations and I encourage you to read what he has to say in his blog post titled, MNPS Neglects Music Education in Strategic Framework. We’ve spent a fair amount of time this year discussing Scholastic, inc. There was the trip to Amelia Island for a literacy conference. They were supposed to get a large contract with the district but had to settle for a smaller one to furnish teachers at select schools books for individual classroom libraries. Word on the street was that their contract with the district was not going to be renewed, but apparently their services are still available upon request to schools in the bottom 10%. Now we have a new Director of Literacy, Barbara Lashley, who comes to us via Scholastic where she was/is a Regional Literacy Consultant. I’d like to say was, but her LinkedIn profile indicates that she is still employed by Scholastic. Normally that would raise any flags, but due to the abnormally cozy relationship between certain MNPS staff and Scholastic it calls for clarification. Lashley earned her doctorate from Argosy University Sarasota. Mark your calendars for August 21st. That’s the day that a rare, total solar eclipse will sweep across the continental U.S. for the first time since 1918, and Nashville is the biggest city in its path. This is truly a once in a life time experience, as the next visible eclipse in Nashville will be in 2566. Being that this is a school day and MNPS is engaged in a STEAM initiative I am confident that the district will be taking full advantage of this unique opportunity and will have extensive activities planned….what…kid’s are not in school that day….The district decided schools should be closed…oh…I’m sorry…carry on. The Country Music Hall of Fame has announced that it will be offering free admission to area students. This is a huge deal and makes the museum available to many students that might not ever get to experience it’s riches. Thank you CMHOF and we salute you! More big news. 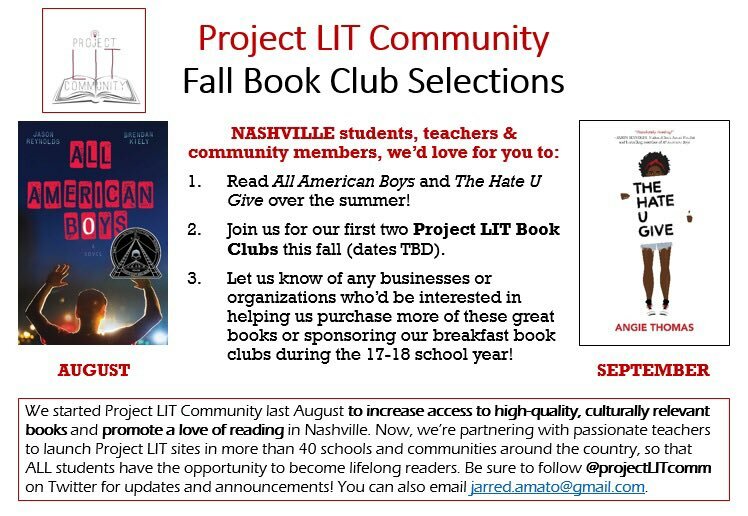 Project Lit has announced it’s schedule for August and September. I’m so looking forward to attending these two up coming book club meetings. I strongly encourage everyone to get involved in this initiative. Kudos need to go out to MNPS’s ELL department. 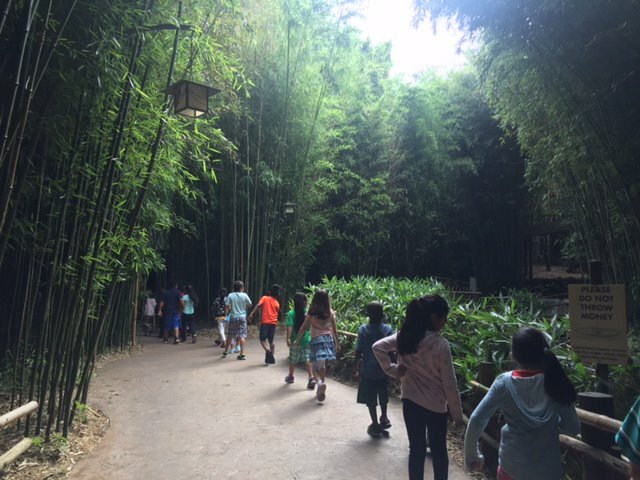 Too often summer school is utilized as an extension of the school year and poor and non-English speaking students are forced to endure more direct instruction while their wealthier counterparts are out having more hands on experiences. This year the ELL department made sure that wasn’t the case. 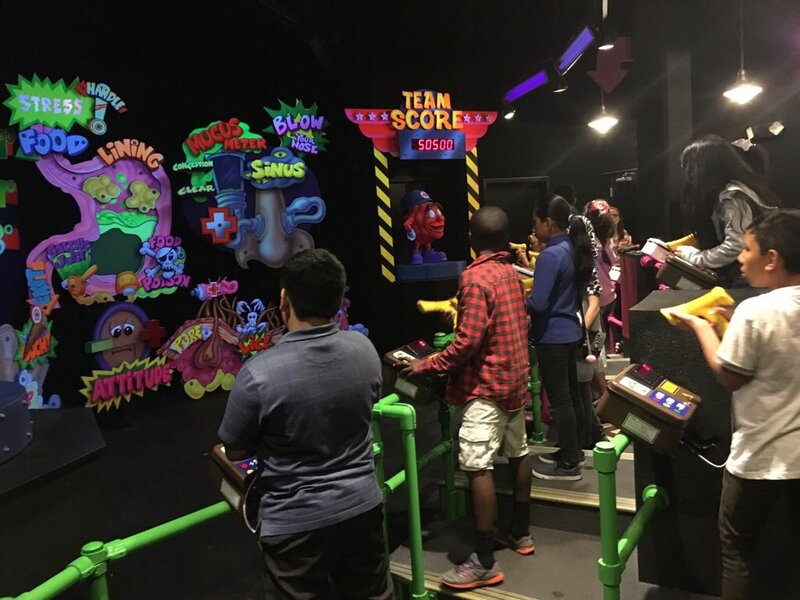 In addition to extra instruction students also got to go to the Nashville Zoo and several museums as well as being offered ample opportunities to engage in artistic and athletic activities. Well done guys! These kids lives will be so much richer due to your work and dedication. The Nashville Scene published a look at the status of charter schools in Nashville this week. Apparently charter school supporters are a little quieter this year since several high profile leaders have left town. I would argue that one of the inherent problems with charter schools is that they have a tendency to be personality driven. Would Valor be Valor without Todd Dickson? I don’t know. Often the schools thrive under dynamic leadership only to struggle and close once that leader leaves. Charter supporters could argue that the same holds true for traditional schools and this year several of those schools will get the opportunity to find out if they will be the same school without their dynamic leader. There is no doubt that strong leadership is an essential ingredient. My two takeaways from this article are, one, that again we are having the wrong conversation, focusing on the strength of one sector vs the strength of the whole system. The question we should be asking is, are schools measurably better this year then last year? Furthermore, do we have a better understanding of why parents choose charter school options? My second take away is that, for what it’s worth, in the short term I’ve known her Wendy Tucker has never shied away from saying “charter school” and Jon Rybka is a genuinely nice guy trying to navigate a political landscape that is beyond his scope of experience. To paint them as Boris and Natasha cooking up a plan in the corner is to put it politely, a bit of a stretch. But hey, we boogy men sell and I can probably be accused of creating my own. At some point we also need to recognize that the whole choice system contributes to the inequity of schools. A parent choosing to send their child to an our of zone school has the same impact as that parent opting for a charter school, private school, or home school. As much as I don’t believe in charter schools I find it hard to fault parents for taking advantage of options that a system provides for them. Charter schools are just a branch and until we are willing to have honest conversations about the whole tree, there will continued to be increased inequity. Anybody seen any TNReady results? It’s Friday so that means I have questions. My first question has to do with charter schools. The local wars have heated up again and I’m curious as to what you think policy should be. Looking at the MNPS employment page, I see that we have just shy of 400 certificated positions open. I wonder if Teach For America will be approached to help with this short fall. After all, the premise of their contract renewal was based on an anticipated teacher shortage. Whether we further utilize TFA or not, I thought I’d ask your opinion of the organization. The last question has to do with the pending solar eclipse. MNPS has decided to close schools that day. What’s your opinion? Is that the right choice or the wrong? There you have it. Feels weird already wishing you a great weekend but I’ll do it any way. See you on the other side. Next RECAPPING AND FORWARD LOOKS.